Sabrosura's Hong Kong owners have carved themselves a unique little niche in Bronx, serving very high-quality fare that is admittedly much more Latin in flavor than Asian. This "Chino-Latino" joint prides itself on presentation and style, but ultimately the regulars keep coming back for the good food and gigantic portions. While you are ordering, a nice basket of garlic bread is brought to the table. The staff is focused, yet attentive, and willing to cater to everyone. Show a little curiosity and they will treat you like a king as they seem accustomed to the same clientèle over and over and welcome an oddity. 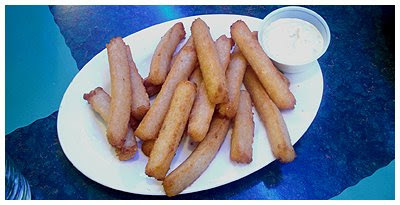 The yuca frita ($2, above) make an excellent appetizer and are accompanied by a subtle tartar sauce. The sticks are mashed and then fried and are light years ahead of anything made from potatoes. 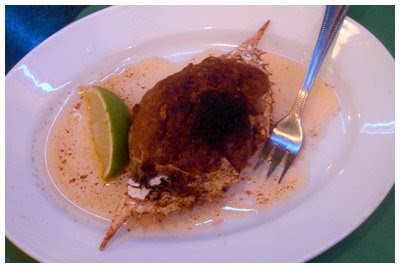 The stuffed crab ($3.25, below) was a crowd favorite and particular delicious when smeared in the clear reddish sauce it was served on top of that tasted a little like Vietnamese fish sauce. It's fairly small and each person will want to nibble, so only plan to share with one person or get your own for maximum satisfaction. 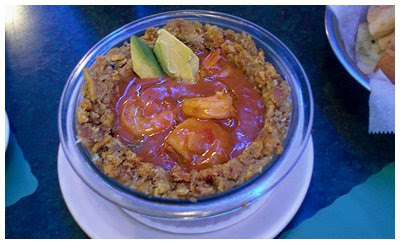 Any visit would be incomplete without the thoroughly baffling mofongo bowls ($11.95, below, shrimp). Typically a mofongo is a simple mash of fried green plantains, served sometimes at breakfast with eggs or beans. Here at Sabrosura, they make a bowl of it and add the meat you choose and a "soup" that ultimately gets mixed together with the mash and creates a great sauce. Have you ever seen anything like it?